I have been holding off mentioning Christmas for fear of upsetting anyone but, having been super-organised I went to the Dundrum shopping centre (Ireland’s largest) on Thursday night to Christmas shop and had an awful time since the whole population of Dublin as well as Co Wicklow and Meath also decided to go. So, no holds barred now – I will mention the unmentionable: poinsettia, poinsettia, poinsettia. POINSETTIA! 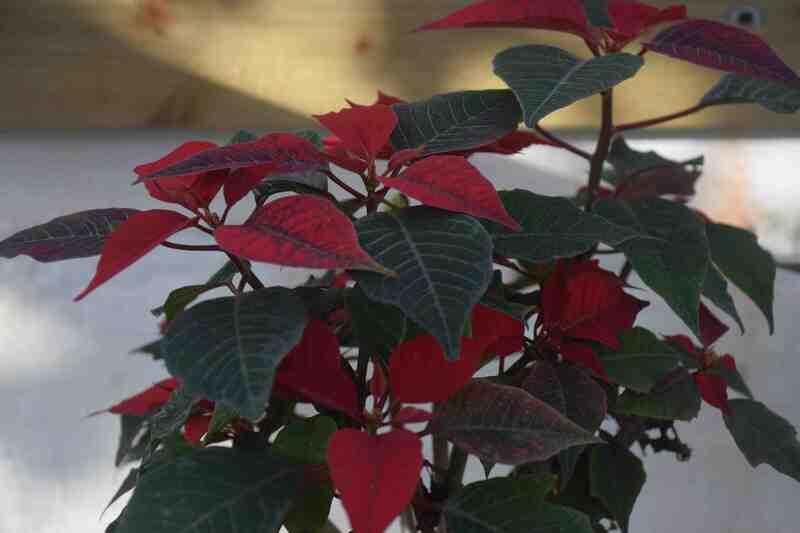 I usually consider poinsettias to be disposable and I never really worry when the leaves drop off in mid January. I don’t really want to see them after Easter and they are so cheap to buy that I don’t care if they die. And besides, I always want a white one or a pink one or a glittery one the next year so I buy one of those. And when I look at it on December 19th I decide that pretty though the pink ones are I really need a red one so I rush out and buy a second. But this one survived. Maybe it was because it was a locally grown plant, and it was certainly in a large pot compared to the imported ones. So it kept its leaves and in July looked a bit overgrown but was still healthy. It was a bit late in the season really but it had to be pruned. It should have been cut back in April really to give it time to regrow. 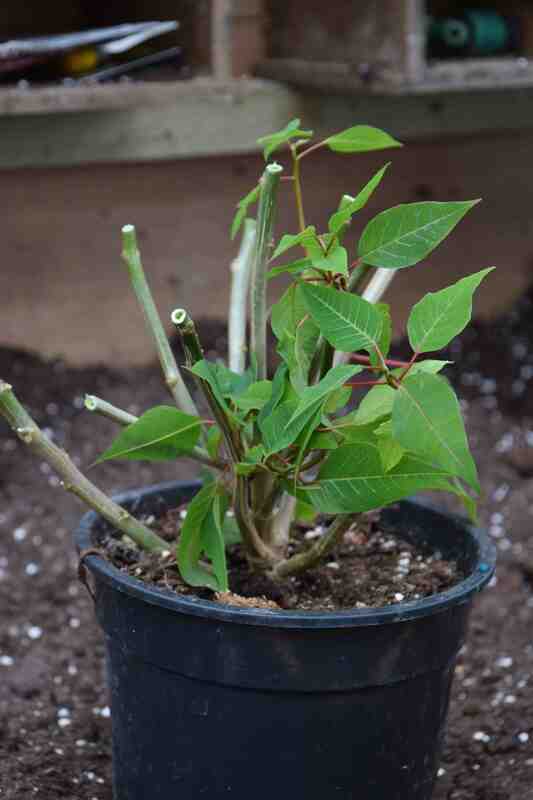 …We all know that if you want a poinsettia to produce bracts again, after September, you have to put it in a cupboard at night and take it out again in the morning. This is not because the plant is agoraphobic but because the plant is stimulated to bloom by long nights and short days. 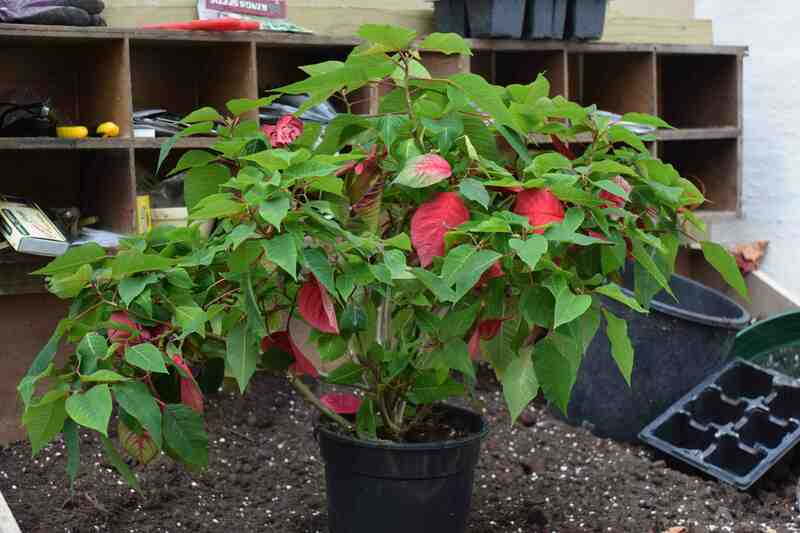 If the plant is subjected to artificial light that effectively lengthens the day it will not start to produce bracts. So because this plant has been in a greenhouse where there has been only natural daylight, it started to make bracts in October and this is how it looks this week. I am mildly proud. There’s life in the old thing yet. A couple of years ago I managed to keep a poinsettia going for about 18 months… so disappointed when it eventually shrivelled up in the heat. We don’t have that problem here. Only igloos suffer from the heat here!